What every entrepreneur already understands is that for a company to be successful, it must make more money than it spends, but when launching a new venture, the reality is that your company is not going to make more money than it is spending, and that is okay – if you understand the J curve. Understanding the J curve will help you secure the right amount of financing for your new startup, and help you get your new startup to a cash positive point. 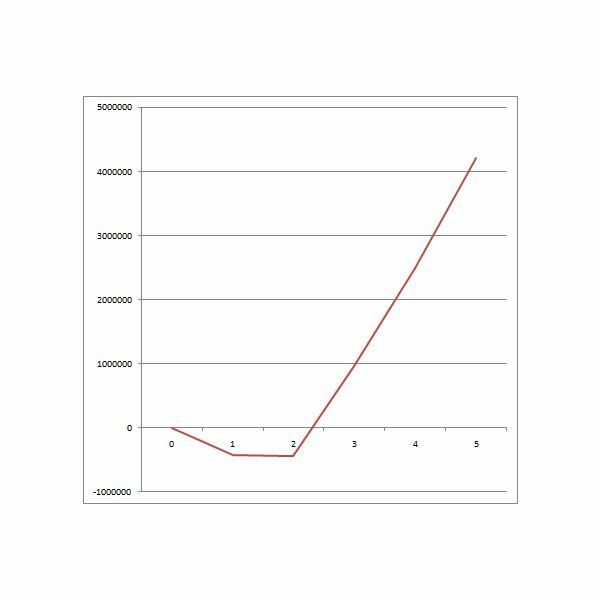 The J curve (see Figure A) is the graphical representation of your company’s net cash flow over a period of time. When dealing with the J Curve, we are specifically dealing with a new startup. Your cash flow will be a projection based on well researched numbers. If an entrepreneur hasn’t thoroughly researched all the expenses that go into starting the company, and if that entrepreneur doesn’t have a realistic timeframe of how long it will take to get from the red and into the green, a venture capitalist is not going to invest. Afterall, they are investing in you. Doing your homework is one way in which you can help the investor see you as competent and worth their investment. Below is an example of an ideal cash flow for a new venture. The zero on the horizontal axis represents your break-even point. Before you start the company, you are at zero. You dump a lot of money into the company over the period of a few weeks or months, and you are in a negative cash flow. Now, your company may be selling products or services, even from day one. So let’s say we spend $100 in the first week of operations, and we bring in $30. Our cash flow is a negative $70. The next week, we dump an additional $200 into the company, and bring in $40. We add the $200 to the $70, subtract the $40, and we are at a negative cash flow of $230. As stated earlier, Figure A shows the ideal cash flow for a new venture. I’ve heard it refereed to as a hockey stick. Why we want our cash flow to look like a hockey stick is because it is realistic. It takes money to make money. A venture capitalist will look at this and in one fast glance know that you are accounting for all your costs, and they can also see at what point the company they are investing in is going to be cash flow positive. Now that we understand what the “J” curve is, how can we make this knowledge applicable to starting a new venture? The key here is understanding the principle that it will take you twice as long and cost you twice as much than your worst case scenarios projected, to turn a profit on your new venture. Therefore, when securing financing from venture capitalists, you need to make sure you are sitting on enough money to make it back to that break even point on the “J” curve. Then, when you launch your business, roll up your sleeves and work until your profits start to outpace your expenses. You may be $500,000 a month in the hole, but as long as you’ve projected for that, then even when you are at the lowest point on the “J” curve, you maybe, just maybe will be able to get a little sleep a night, because you’ve already projected these losses and can see that your new venture is moving along to its break even point as planned.